Monaco Yacht Show 2013 sunset panorama overlooking the Côte d’Azur. 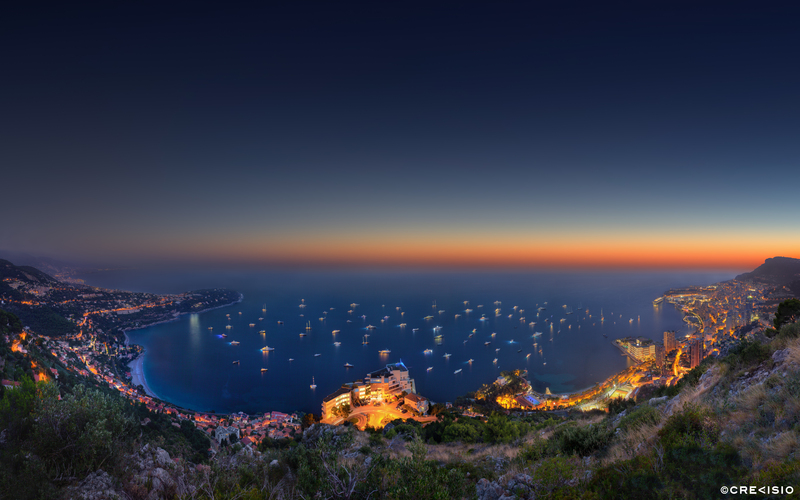 The photograph spans a full 180 degrees from the Principality of Monaco, over the Vista Palace hotel in the foreground, to Roquebrune Cap Martin, Menton, and Italy’s Ventimiglia. Shot during the evening before the official begin of the Monaco Yacht Show, our photographer was lucky to catch a clear sky, since only one day later, during this year’s yacht show event, the weather was not very positive. The full resolution is a staggering 560 megapixel TIFF file (total resolution of 29,505 x 18,440 pixels at 300 dpi).